You are invited to attend the Peninsula Community of Schools Art Exhibition in celebration of Aboriginal and Torres Strait Islander Culture on the Northern Beaches. This is a showcase of students work from Kindergarten to Year 12 from the 13 Peninsula Community of Schools; Avalon, Bilgola Plateau, Collaroy Plateau, Cromer, Elanora Heights, Mona Vale, Narrabeen Lakes, Narrabeen North, Newport, and Wheeler Heights Public Schools and Barrenjoey, Narrabeen Sports and Pittwater High Schools. The exhibition is located at Kmart Court in Warriewood Square with large format canvases displayed around the Centre. As part of the exhibition a Peninsula Community of Schools silent auction has been launched with 100% of all proceeds to be donated to PCS. You can see these wonderful artworks from talented students in the Peninsula at Warriewood Square and below. The auction ends 12 noon Saturday 24th of June. Winners will be contacted via phone and email. A reserve of $200 has been placed against all paintings. Good Luck! At the Opening Night, Thursday 15th of June, visitors were entertained by Aboriginal dancers and musicians and met the students who created the wonderful pieces of artwork on display. Our Education Minister and Pittwater MP, Rob Stokes attended, along with the very best principals and teachers in the peninsula and a representative from Broadspectrum, which has sponsored the event for the past five years..
Neil Evers of the Aboriginal Support Group Manly Warringah Pittwater gave the Welcome to Country. 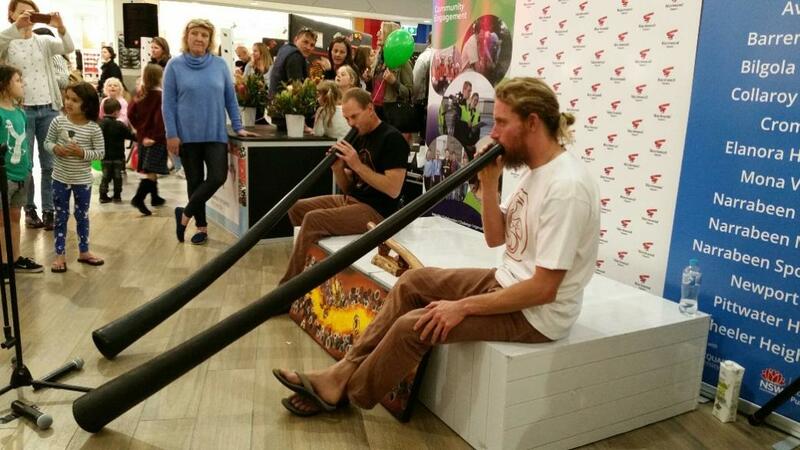 Music was provided by Laurie Bimson and Didgeridoo players Scott Romain and Matt Jones. I’m Neil Evers, I’m a direct descendant of the Garigal clan of the Guringai people. The Guringai people are part of the oldest continuous culture in the world, and I pay my respects to the elders, past and present. I also recognise their resilience and strength and courage. I’d also like to thank Westfield, Warriewood Square, the Peninsula Community of Schools and Broadspectrum for acknowledging and recognising the traditional custodians. I’ve been asked to give a Welcome to Country – what is this Welcome to Country? Am I welcoming you to Australia? No, certainly not. Have you ever seen a map of Australia, prior to 1788? There were 300 plus sovereign aboriginal nations that spoke over 600 languages and dialects. So prior to the British arriving there was over 300 different countries in Australia. If you look at that ma, from about Newcastle, down to the harbour bridge, you will find it is the Guringai language – that is the group that we’re in now. So a Welcome to Country extends from the generation of old out of respect for aboriginal people to the custodians of that land. In traditional times nobody moved without acknowledgement. It was protocol. If you didn’t it would be like you going into somebody’s house uninvited, helping yourself to their drink and food and staying the night. Aboriginal people knew the boundaries of the other people’s country and the other’s group. To go form one group to the other you had to get acknowledgement. They would invite you there as a visitor, or they would give you a safe passage through their country. It is not something done out of political correctness. It was done out of an aged tradition that acknowledges and recognises the traditional custodians of that country. So the more we learn, the more we understand. The first Australians, the aboriginal people, utilised this land and its gifts for generations. Just think about 230 years ago, how different this place would have been – the creeks, the rivers were crystal clear, the fishing, there was an abundance of food in this area, and these stories are told right across this area. These were hunting grounds and camping grounds for my ancestors. But they didn’t own the land, they were custodians. So I ask you, please, that you care for Guringai country. And as a descendant , and on behalf of the ancestors, the traditional custodians, I welcome you to this beautiful country. I too would like to pay my respects to the elders past and present and acknowledge the Garigal people of the Guringai Nation on whose land we are gathered here tonight. This message stick signifies an important event is taking place. The Wheeler Heights community has been a custodian of this message stick for the last 12 months, and also the beautiful artwork which was gifted to the PCS by the aboriginal artists in the Beswick Community in the Northern Territory. It is my great honour tonight to hand the message stick to the Narrabeen Lakes community and Mrs. Susan Tickle – I hand the responsibility and the care into your keeping. You will be the custodians for the next 12 months. Thank you ladies and gentlemen, boys and girls. I too would like to acknowledge the Garigal people of the Guringai Nation and pay my respects to elders past and present and to extend those respects to aboriginal people here with us today. We’ve heard from Neil Evers just how important that principal of acknowledging custodianship of land is and this is an important way in which we can, as a community, recognise our current custodianship of a land with an extraordinarily rich and deep and long heritage. Boys and girls, some of you may have been learning in school about family trees, and you might be able to go back to your parents, and grandparents, and even great-grandparents. This continent lays claim to the oldest continuously surviving culture anywhere in the world, a culture that gores back at least 50 thousand years, but in more recent evidence shows this could go back much further again. So we have a very very special place to look after as the current generation. It is also important for us to recognise that locally there is an extraordinarily rich and diverse legacy of continuing aboriginal settlement. Just last weekend I had the opportunity to go with one of my daughters into Ku-ring-gai National Park, where there are more than 800 documented aboriginal sites, sites of continuing occupation. If you want this weekend to ask your mum and dads to take you down the Elvina Track and just go off the track as I did and you will be able to see some incredibly beautiful engravings of native animals , engraved 200 years ago and continuously for hundreds and hundreds of years before that, as a symbol of continuing occupation and custodianship by the Garigal people. That is just one example of the richness of aboriginal culture all around us. At Belrose we saw the dedication of one of the most recently recognised aboriginal sites – Moon Rock, a place that is all about Baiame, an important figure of the Dreamtime and another example of that rich tapestry of aboriginal stories that unite those 300 nations Neil spoke to us about. Tonight is a night to celebrate the artwork of the children and the wonderful leadership and support and care provided by so many teachers across the 13 PCS schools. Another rich legacy that we are part of here in this community is New South Wales Public Education and we have many fine schools that are showcased tonight in terms of the care exercised by teachers and the wonderful talents that our young people have and that these teachers have empowered them to show us tonight. And I in my role, both as Education Minister and Local Member, say how proud I am of the work going on in our local public schools, and that this is a wonderful showcase of both the talents of our students and the incredible support provided by our teachers and our education leaders. I want to thank Broad Spectrum for their generous support of this evening and in particular Michelle for her work with the leaders across the PCS schools – thank you so much for your leadership. Ladies and gentlemen – thank you so much for being with us here tonight – and children, thank you so much for sharing your talents with us. The Peninsula Community of Schools was launched in 2007 as a collaborative learning community of 13 local state schools on the Northern Beaches; Barrenjoey, Narrabeen Sports and Pittwater High Schools and Avalon, Bilgola Plateau, Collaroy Plateau, Cromer, Elanora Heights, Mona Vale, Narrabeen Lakes, Narrabeen North, Newport and Wheeler Heights Public Schools. The schools partner with each other to provide over 9,500 students from diverse backgrounds from K-12, with new and dynamic learning opportunities. We build fresh and unique learning opportunities for students that are creative and relevant in the 21st century. Our extensive enrichment program aims to strengthen the academic, creative, social, physical and leadership capabilities of our students. We work collaboratively to connect our students to a broad range of experiences and competitions that take students beyond the classroom and encourage lifelong learning. Through these rich experiences, students further develop their knowledge, skills, relationships and values. The Peninsula Community of Schools has a commitment to ongoing improvement through a comprehensive teacher professional learning program. Peninsula Community of Schools staffs participate in specialised workshops each term, supported by university staff, teachers and community partners, in which they are immersed in the most recent teaching and learning practices designed to improve student outcomes. Images courtesy ASGMWP and Warriewood Square, 2017.